This entry doesn’t exactly have anything to do with teaching, but it does have a lot to do with the fact that not every student we encounter in schools will be an outgoing little pillar of social confidence – and neither will every teacher. I am introverted. I’ve known that since I was about four years old, although it’s information that my parents and teachers have always had difficulty accepting – which sounds ridiculous. I don’t have a second head and I’m not a serial killer or a giraffe in disguise. And yet it was – and still is – as if they thought introversion was a disability or defect of some kind; like they thought I couldn’t possibly live a normal or happy life if I didn’t have twenty-eight best friends. It isn’t a disability, although it can, at times, be a difficulty. But even if I’m not going to be that teacher who is best friends with every one of her students, I am going to be the teacher who pushes everyone to be their best and to love what they do and seek/strive/thrive no matter what problems and challenges they face. People come in all shapes and sizes, and I’m glad of every single one of them – even (if not especially) the ones that make life just a little bit more complicated. A world without Introverts would be a world with few scientists, musicians, artists, poets, filmmakers, doctors, mathematicians, writers, and philosophers. Introverts cannot “fix themselves” and deserve respect for their natural temperament and contributions to the human race. 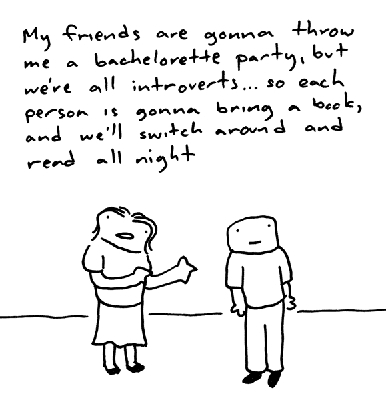 In fact, one study (Silverman, 1986) showed that the percentage of Introverts increases with IQ. This entry was posted in About Me, Miscellaneous Entries and tagged diversity, introversion, teachers, teaching philosophy, the mythological introvert. Great post – I can totally relate. I’ve had a lot of teachers and people question my ability to be a teacher, but I’ve shown them that in a classroom with students I am able to teach and to engage and interact with students. I may not be the talkative one in the staffroom but I can engage and contribute when I feel that I have something to offer.